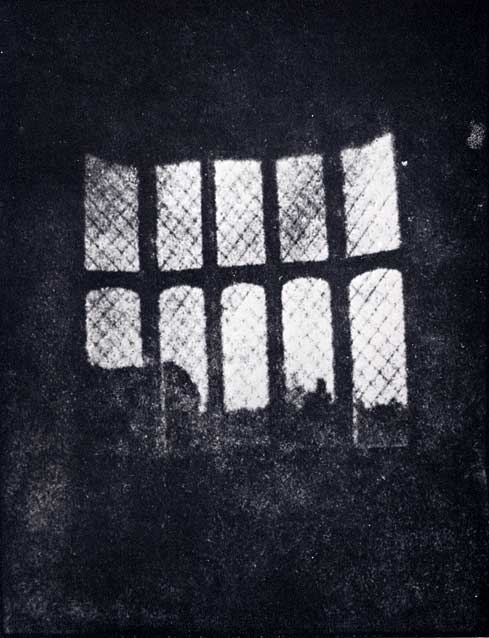 Over 100 years ago, Henry Fox Talbot invented the film negative. Chandni Gajria goes back in time to rediscover the life of this inventor. 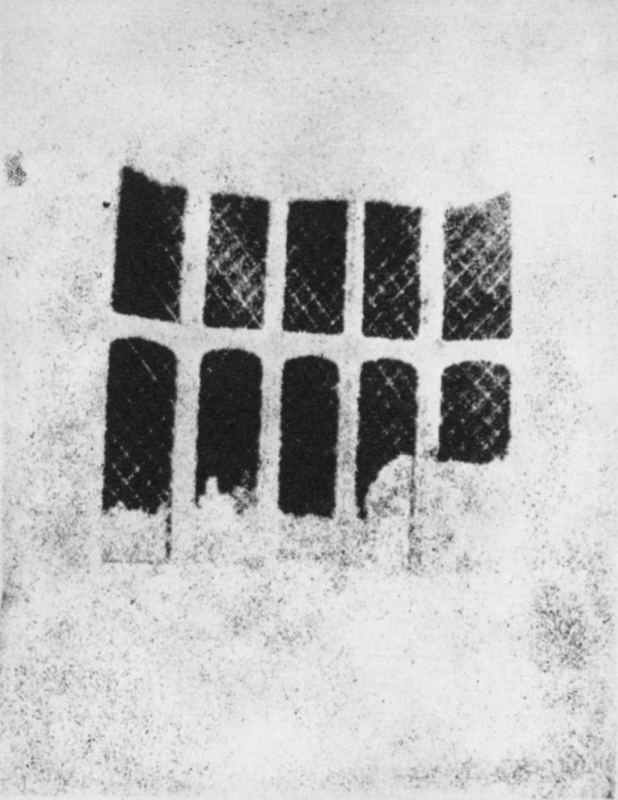 Sometime in October 1833, while enjoying his honeymoon on the shores of Italy’s Lake Como, William Henry Fox Talbot struggled to sketch the beauty of the landscape he saw, using the camera lucida. “When the eye was removed from the prism of the camera lucida, I found that the faithless pencil only left traces on the paper, melancholy to behold,” he wrote describing the moment in his famous publication Pencil of Nature in 1844. 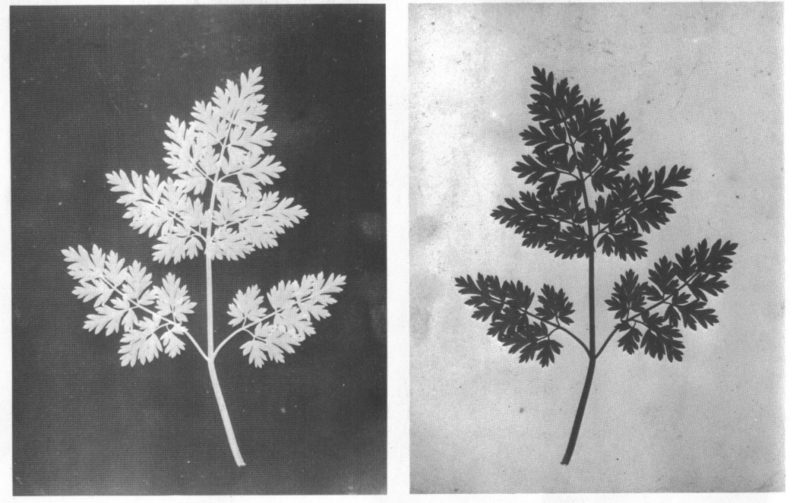 Made in August 1835, this positive (left) is from the oldest camera negative (right) in existence today. Talbot was an infant when his father passed away. This left his mother, Lady Elizabeth, and him with a ruinous estate. Talbot’s mother later remarried an affluent Captain Charles Fielding. 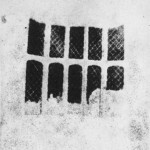 Fox Talbot then obtained connections and access to the elite in scientific and political social circles. 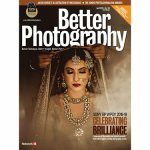 He had done optical researches and written papers for journals that helped him with his endeavours in photography. 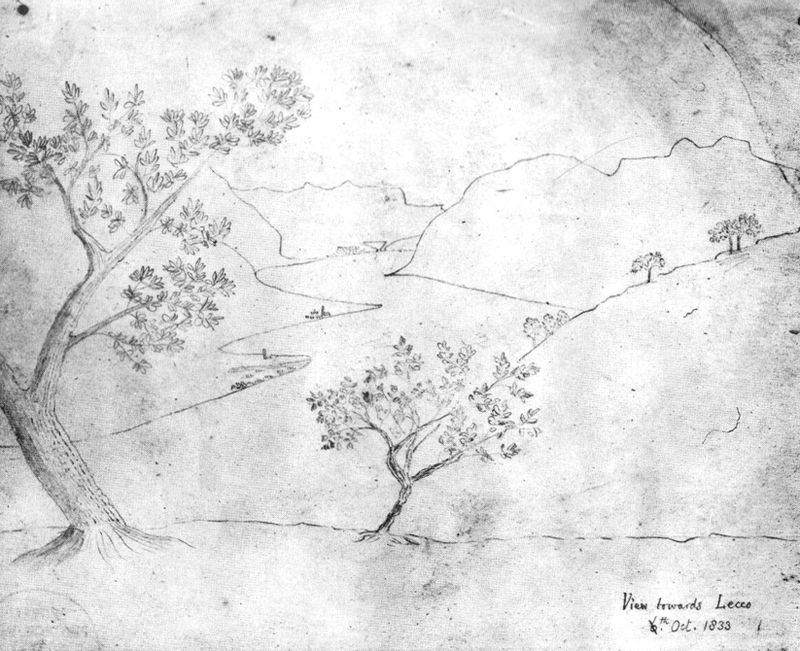 Talbot’s drawing of the city of Lecco, Italy, made using a camera lucida is hardly a sketch. It shows his struggle with the drawing instrument. Talbot met the English mathematician, chemist and experimental photographer, Sir John Herschel in Munich in 1824.This chance meeting established a strong collaboration between Talbot and Herschel and both began exchanging work notes. Two years later, Herschel introduced Talbot to Dr David Brewster, the Scottish scientist and encyclopedist. Brewster and Talbot’s research on light frequently overlapped. Brewster began publishing Talbot’s scientific articles in his journal and the two men maintained a lifelong friendship. 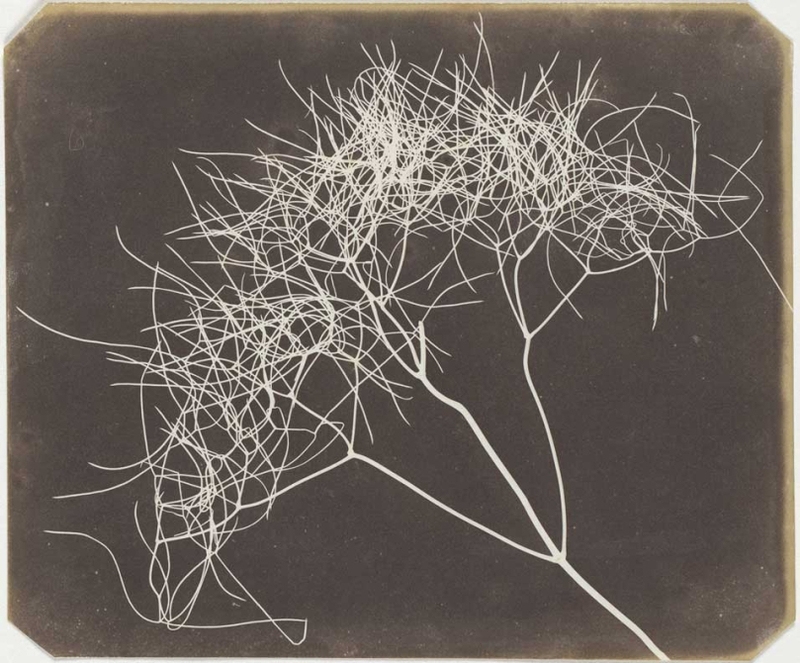 During his initial experiments, Talbot made numerous photograms of plants, leaves and flowers. On left, is the negative and on right, the positive print of the image. 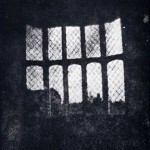 It was in the spring of 1834, that Talbot began photography experiments at his residence in Lacock Abbey, Wiltshire, England. His initial process involved coating ordinary paper with alternate washes of table salt and silver nitrate. Therefore, when the paper was placed in the sun, under an opaque object like a branch or a leaf, the uncovered area would darken. Talbot then placed sensitised paper in small wooden cameras around the grounds in Lacock Abbey. These were the first negatives and took an hour or two to expose in bright sunlight. When printed back on sensitised paper, the tones reversed.With one negative, Talbot had now found a way to produce multiple positive prints. 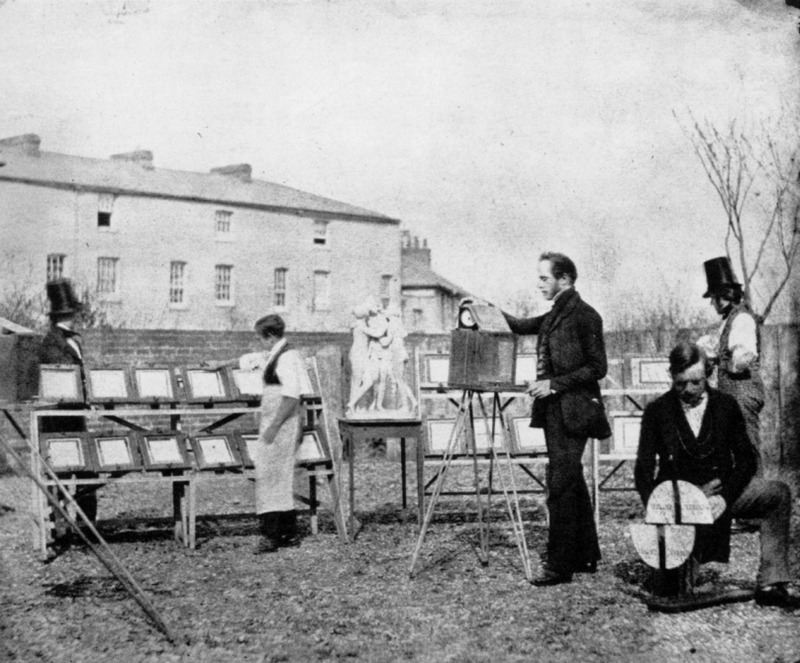 Henry Fox Talbot’s assistant Nicolaas Henneman’s studio in Reading, England. 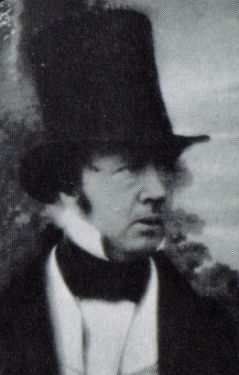 For the next three years, Talbot engaged in other optical studies. 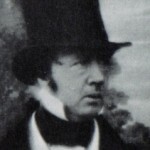 In 1839, he announced his invention and presented the photograms he had made to the Royal Society and Royal Institution. A few weeks later, Talbot was shocked to hear about a Frenchman named Louis Daguerre claiming to have captured images on plates. 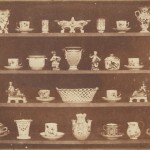 Daguerre’s process, unlike Talbot’s, gave detailed, highly-finished camera pictures in lesser time and was likely to be the future of photography. Not to be outdone by Daguerre, Talbot immediately began researching and improving the stability of his process. A salted paper print from a calotype of fruit sellers, in the garden. England, 1844. After Daguerre’s announcement, Talbot remembered a letter Herschel sent him, which mentioned that he could have used gallic acid in his process because it reacted differently to light compared to other salts. Somewhere in mid-1840, Talbot experimented with a solution of silver nitrate, acetic and gallic acids to wash the sensitised paper. But before coating the paper in this solution, it was first brushed with potassium iodide and sodium nitrate, to produce a yellow coating of silver iodide. The new process calotype or talbotype reduced the exposure time from hours to just a few minutes and even seconds! A calotype of Horatia Fielding, Talbot’s half sister. 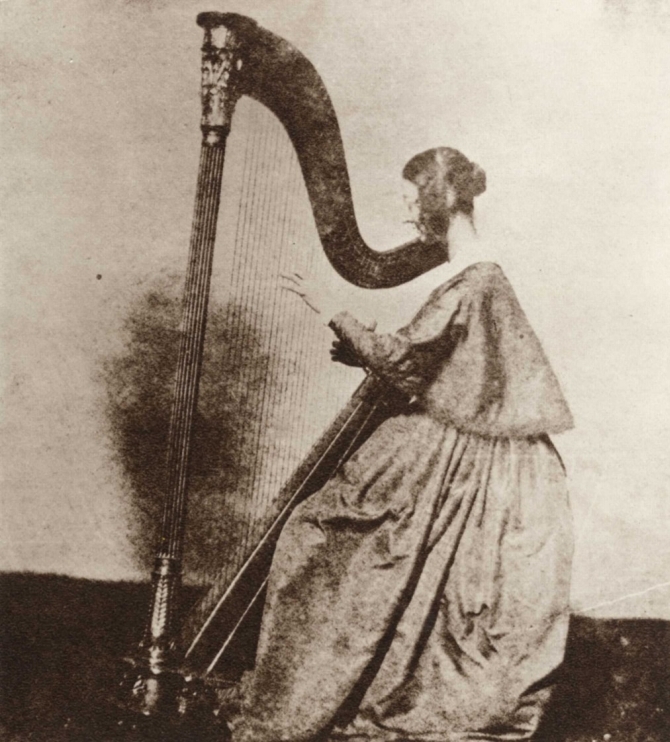 Here, she is seen playing the harp. In 1841, Talbot patented his invention and by 1844, he published Pencil of Nature. This illustrated book contained 23 original photographic prints and gained Talbot a lot of recognition. Talbot even received a Rumford Medal by the Royal Society for his discovery. 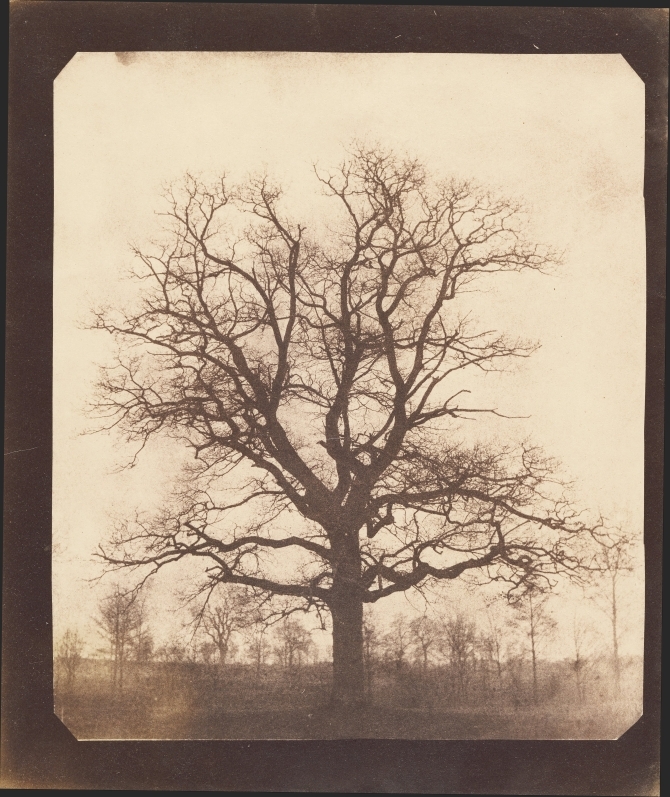 A salt paper print of an oak tree in winter, this image was made between 1842–1843. While Daguerre’s process was free to the world except Great Britain, it also produced sharper images compared to the calotype. Talbot’s patent, on the other hand, required people to pay a sum to use his process. 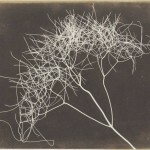 Things also turned sour for Talbot when he tried to use the patent to prevent others from improvising and inventing similar methods to the calotype. 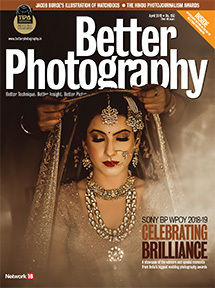 In 1854, the court ruled that though he was the true inventor of photography, the newer processes were outside his patent. The court proceedings had stained Talbot’s reputation to such an extent, that he was widely criticised and even spoken ill of in the papers. While Daguerre received widespread recognition, Talbot’s own government refused to acknowledge him. However, the use of the daguerreotype died by 1860. 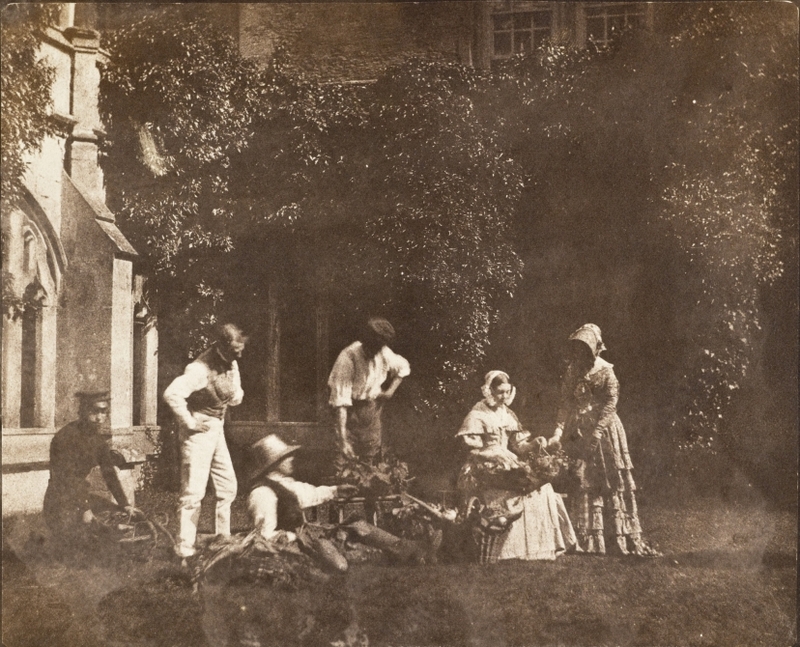 Talbot’s negative and positive process is what became the basis of photography in the 19th and 20th century. Today, almost 136 years after Talbot’s death, an extensive archive of his images and research manuscripts remains in the public domain, waiting to be explored. Lacock Abbey, from where Talbot began his journey, still stands today, reminding us of this inventor and the pathbreaking work which went on to become the foundation for darkroom processing for several decades. 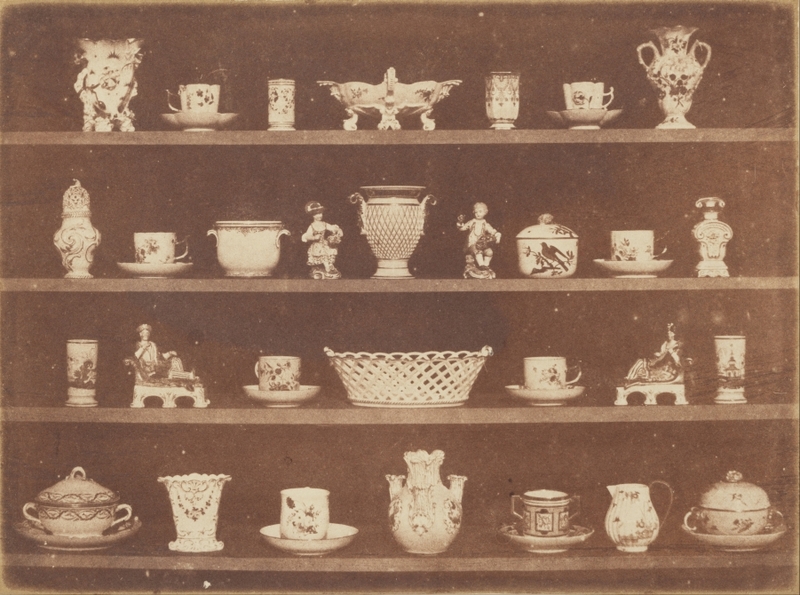 Talbot included this picture of porcelain articles in Pencil of Nature to show painters that photography could capture subjects of their interest. This specimen of a tree branch was photographed sometime in 1835.